Now, while I know you can’t pick and choose which items you want from the box, I included the Should I Buy posts from the past so y’all can see how much they originally cost & what specifically each building/character does. 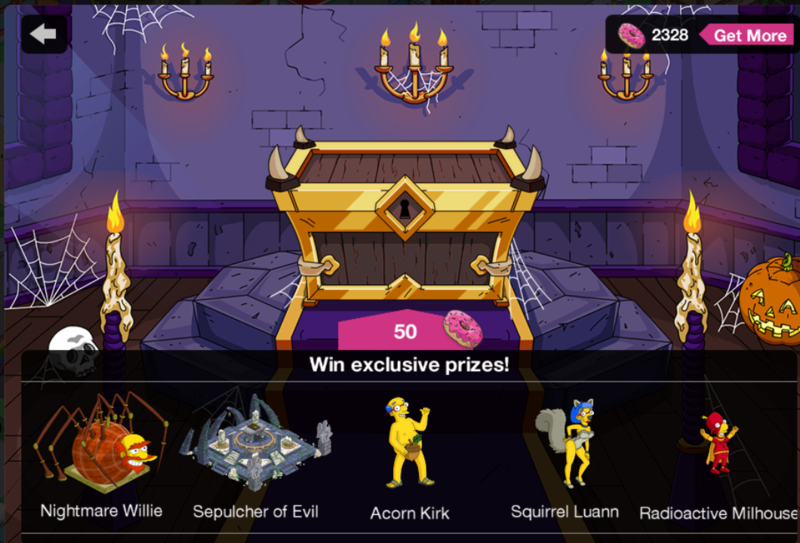 50 Donuts is a bargain for most of these items (especially for the Acorn Kirk skin (HILARIOUS animated task), Sepulcher of Evil & the Nightmare Pile)…except for items that were originally free, as getting it for free is the best deal…but still 50 donuts is a fair price for most of the items at least. So my thoughts are, if you have something in there you want…give it a try. You’ll likely get something worth it. And that’s it my friends! 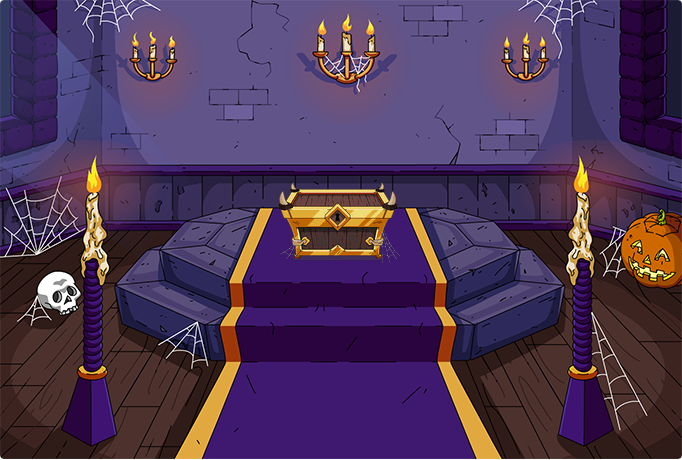 The details on the Halloween Mystery Box…. 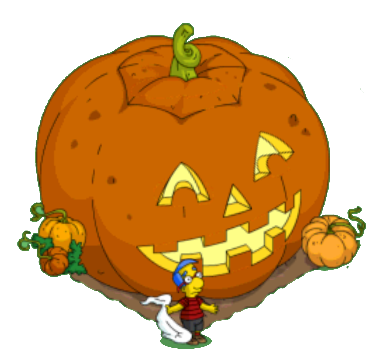 This entry was posted in Buildings, Characters, Decorations, Donuts, Should I Buy, Tips and Tricks, Updates and tagged How do i get Acorn Kirk, how do i get devil flanders, How do I get Squirrel Luann, How do i make the kids trick or treat, nightmare pile, should I Buy the halloween mystery Box?, Tapped Out Angelica Button event, Tapped Out Halloween 2017, Tapped Out Harry Potter Event, Tapped Out Magical Halloween, Tapped Out Tips and Tricks, The Simpsons Tapped Out, trick or treating kids, TSTO Addicts, TSTO Halloween, TSTO Magical Event, TSTO THOH 2017, TSTO Tips and Tricks, What's inside the Halloween mystery Box?. Bookmark the permalink. 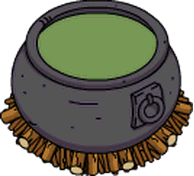 I was surprised yesterday with a message from EA that said “We think the cauldron isn’t what you expected, so here is your 50 donuts back”. I know I had squirrel Luann and Acorn Kirk last year for THOH, I had forgotten about them completely until I saw the mystery box but now it gives me the option to buy them again and the skins aren’t in my inventory. Is this something that has happened to anyone else? I purchased Squirrel Luann also and she is not available to select now either. Is this a known glitch? Yes, I think my game has the same issue as I’m sure I already had squirrel Luann, but there she is in the mystery box. Did you try to get it resolved? Got the evil clown bed – wish I read the Should I Buy more carefully, didn’t realize that only one kid at a time can wear a costume. Why can’t it be like the…bad sandwich (?) that turns several characters at once into zombies for an hour. Wish the nightmare pile worked like the Zombie Sandwich Dumpster. Definitely miss seeing the kids Trick or Treating like in years past. I love that they let the Mystery Boxes stay till the end, currently at 107 donuts once more. Overall I’m happy with the prizes for the donuts: Mutant Rabbit, The Witch and the zombie sandwich. Should I spend donuts on either of the boxes right now or is it a better idea to wait till the end in case another character/combo get’s offered for sale? Of my options I wanted the Sepulcher of Evil, Nightmare Pile, and Devil Flanders. Got lucky and with my first attemp I got the Sepulcher of Evil (best item in box in my opinion:) ), second attempt Devil Flanders. Now I’m just trying to decide if it’s worth trying for the Nightmare Pile. 1 in 5 to get the NP, though also 1 in 5 to get Luanne skin which would sit in storage since I don’t have Luanne. Admittedly FWP. Still nice infusion of Halloween spirit. What happens if you win squirrel Luanne but don’t have Luanne yet? I’ve been lucky with the other mystery box: 5 tries, 5x65D=325D for Maude, Space Mutant and Blinky (but also Battle Dome and TentaCorp HQ which reside in my trash-but-yield-money waste area). Mutant Rabbit and the rest aren’t so interesting for me I would spend another 65D. Premium skins aren’t so much interesting now since I use the walking KEM, but in near future (I hope) optimizing money and XP outcome isn’t important any more. I really miss the funny skins and visual tasks already. Only had Spider Willie, Spulcher of Evil, and the Kirk and Luann costumes. The only thing I wanted was the Spulcher of Evil… So obviously it was the last pull. 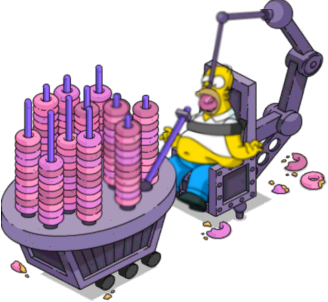 I guess at 200 donuts it’s still cheaper than the Gil deal was… I do regret it a little. Should have just got Raymondo and forgot the Mystery Box. Oh well. Mystery boxes are never very kind to me. 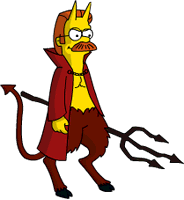 Since it was only 50 donuts I gave it a shot and got devil Flanders which I will use year round cause I love the character and it’s premium. (I’ve been using Puritan Flanders but it’s not my favorite skin for him but my only previous premium.) Took a chance on one more and got acorn Kirk so I got 2 useful premium skins for awesome charactes. Not bad!!!!!!! I was only missing 4 items (Devil Flanders, Acorn Kirk, Radioactive Millhouse, Nightmare Willie) so I bought them all for 200. It makes up for the lack of premium items to buy this week as both the Great Raymondo and Evil Shopkeeper bundles looked terrible. When I try to look at the prizes for how I have left in order to get them I can’t get it to open. I keep tapping it and it won’t open. There are a few things I don’t have, but likely will wait until later to see how many donuts I have left. At least we don’t have to rush a decision. Tempting, tempting! I like the Willie Spider! What the heck! I might spend 50 bonuts. I am happy with the pace of this event, it is not too strenuous and I do not have to wake up i. The middle of the night to get all the prizes playing freemium. It was a little disappointing that this box was so costume heavy, but that didnt stop me from dropping a lot of donuts for the items I did want. Keeping my fingers crossed for an appearance of the Heck House, Freakmobile and Burns Monster. I really want a shot at some of the classic THOH items that I’ve missed.